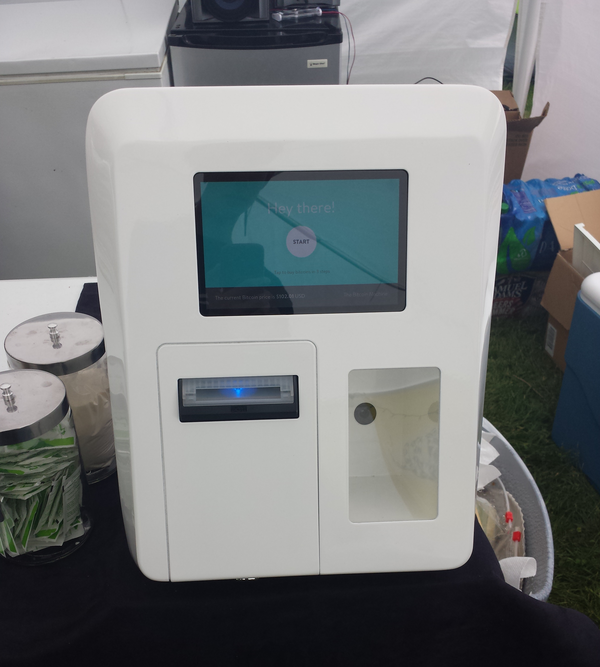 Lamassu's Bitcoin ATM has proven to be a critical piece of Porcfest infrastructure this year. The machine, which allows anyone to insert bills, scan their receiving address and immediately receive bitcoins at a 1% fee, has sold over 16 BTC in the first three days of the event, and its popularity is only growing as the number of participants ramps up. But the aim of the machine is much larger than just one annual libertarian event; Lamassu's founders Josh and Zach Harvey intend to make many more machines and sell them to merchants interested in operating one in many countries around the world. Here, Lamassu's Josh Harvey answers our questions. Vitalik Buterin: What first gave you the idea to create a Bitcoin ATM? Josh Harvey: It stemmed from our frustration in obtaining Bitcoin quickly and seamlessly. The infrastructure of Bitcoin is improving every day, yet at this point it can still be frustrating exchanging fiat into Bitcoin. Especially for first time Bitcoin users. The Bitcoin machine idea was to simplify it all. No signing up, no thirty day wait, just cash to bitcoins. The Bitcoin Machine takes the banks out of the picture for the end user, and that can really streamline the process. Vitalik Buterin: What was the main difficulty in the project? Josh Harvey: The last few days before the prototype debut in Washington, DC (The ISFL Conference). There were a few last bugs that took three straight sleepless nights to fix. We had a déjà vu experience and another three sleepless nights leading up to the Bitcoin 2013 convention in San Jose, to get our second prototype working perfectly. At least this time we weren't still working on it from our hotel room. Vitalik Buterin: It seems like security might be a particular risk, from both a hardware and software standpoint. What steps have you taken to ensure that thieves can't quickly steal the machine or break it apart or attempt to access its wallet with software-based attacks? 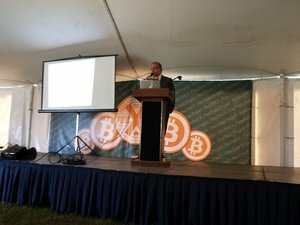 Josh Harvey: The production Bitcoin Machines will have a thick steel chassis and will be bolted to a counter, a wall or a permanent stand. These machines are intended to be installed inside, in storefronts, cafes, and other retail locations. The operator can be alerted every time there is more than say $5,000 in the machine, and it's expected that he will deposit the cash every night. Much of the design work for the production version is focused around both physical and network security. We have very capable people thinking through every part, so we're confident that the machine will be over-engineered for its intended use. Another thing to remember is that our first design will only be fiat to BTC, so we don't have to plan for as much cash as a legacy ATM machine. On the software side, we'll be providing the software for the machine itself, as well as software for a remote server. The remote server will be run by the operator, not by us, but it will be very easy to deploy, for example as a pre-built Amazon EC2 image. We have a lot of experience with network security and we'll have the design audited by top people in the Bitcoin security field. Part of the design process is working on good policies for software updating and private key management. Vitalik Buterin: how hard would it be to adapt the machine to other currencies (eg. CAD, EUR) so it can be used internationally? Josh Harvey: Actually, we are only looking at components that will accept all of the major currencies of the world. Even the first production models will be available for 80-100 different currencies. We have already tested our current prototype with Canadian dollars. Vitalik Buterin: I saw that you're planning on creating more of these machines and selling them to merchants. Have you made any deals yet? If so, what cities will your first few merchants be in? What's the timetable for the machines to be created, delivered and turned on? Josh Harvey: Yes, we are indeed putting these into production. We've received an incredible amount of interest from every corner of the world. Some examples are Pakistan, Libya, Macau, and Australia. We've been getting a lot of emails from Canada, in particular. We haven't begun taking pre-orders yet but we expect to start doing that in about a month. We're planning to ship our first production run end of summer 2013. Vitalik Buterin: Are you at all worried about legal risks (money laundering, etc)? Josh Harvey: It is something we are constantly looking into. We believe that hardware manufacturing of a vending machine (it is not legally considered an ATM) is less of a legal problem than money transmitting services but researching these issues is definitely part of the production process. We are definitely making sure that our prospective customers are aware of the regulations they might be subject to. Vitalik Buterin: Do you have any plans for a machine that could convert between fiat and BTC both ways? It seems like the other direction would be even more useful for tourists, for example. Josh Harvey: The first design will be cash in, Bitcoin out. A dual exchange machine would be more expensive to produce, larger, and more difficult to secure (both physically and developing solutions for double spends). Such a machine would likely pose more regulatory challenges in some jurisdictions. Yes, we do have plans to design one in the future!